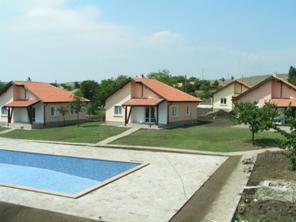 In year 2005 our company started a new develoment project of holiday villas with shared swimming pool. The conceptual design included 16 detached houses, a swimming pool, two covered barbeque areas with dining facilities and a lot of spacious green gardens. The complex is located in Bryastovets – a picturesque small rural village, located only on 20 min drive distance from the Black sea resort of Sunny beach. The peaceful and beautiful surroundings are the ideal premise for a relaxing and enjoyable summer holiday, especially for people willing to stay away from the crowds and the noise of the beach resorts and still to be close to the sea. The complex is set in a wonderfully peaceful location, surrounded by nature offering finished and furnished summer houses for sale and for rent. All villas have three double bedrooms, equipped kitchen and lounge. The villas were designed to provide comfort and relaxation. Complex facilities: a children playground, a 9 holes minigolf playfield and a 7 x 15 meters swimming pool. All areas are designed to be suitable and safe for children and elderly people. The major part of the construction works ended in 2007 and the complex welcomed its first gests for the summer of 2007. In the beginning of year 2009 the minigolf course was constructed. After acquiring the building and construction permits, the works started in the middle of 2005. 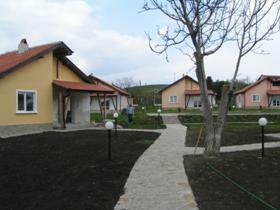 We are an established building company based in Bourgas, Bulgaria. You can reach us at our office every day from 9:00h to 18:00h (local time), or alternatively send us an email to the email address published below. We will contact you in shortest time with an adequate reply to your request. © Investconsult Ltd. 2017. All rights reserved.